Make a very cheap, relatively easy to construct robot which will wake up any time you shine a desk lamp on it. There are no sensors on it, although I suppose the solar panel can be called a sensor. I plan on adding solar panels and another motor, and making it controlled by a PIC microcontroller in the future. The circuit for the robot is very simple, it has no digital electronics. 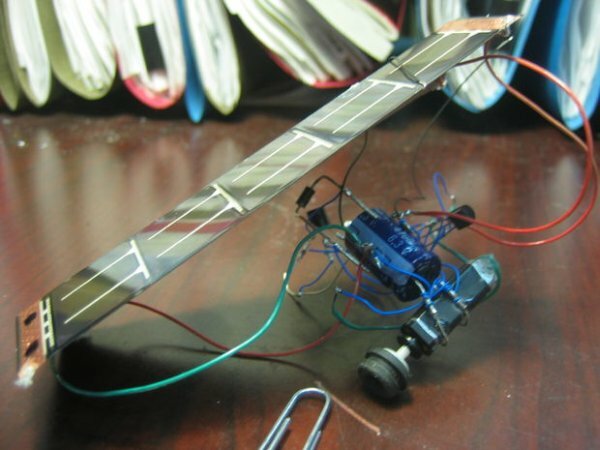 It’s called a ‘miller solar engine’ (http://solarbotics.net/library/circuits/se_t1_mse.html) and it allows a small solar panel to power a motor. The solar panel stores energy over time by charging the capacitor in the circuit. When enough energy is stored (this is sensed by the ‘1381’ part) the energy is allowed to flow through the motor and the robot moves. Then the whole process repeats. 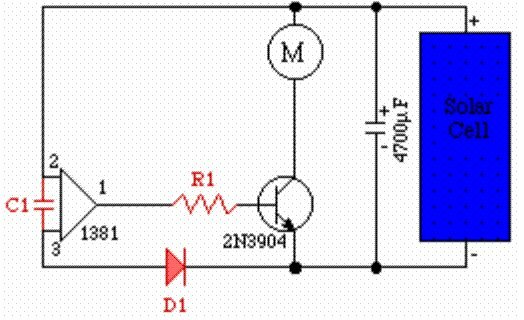 In the circuit diagram, C1 is a capacitor, D1 is a diode, R1 is a resistor, and the circled M is the motor. or do a google search for BEAM hobby stores. To make you robot correctly you’ll have to use appropriate components. Depending on the motor you use, the optimal component values will differ, so you should buy a range of values for each component. After getting a nice assortment of component values make a little prototyping circuit so you can easily swap in and out different part values. You can do this on a breadboard but I made a permanent circuit to test future robots. Also, varying the either of the capacitors and the resistor will alter how much power goes to the motor and how long the time is in between motor movements. A 100 ohm resistor, a 3300uf capacitor and a 0.22uf capacitor, and some random ‘signal’ diode I found (it’s not that important). www.digikey.com or www.jameco.com or www.mouser.com, or some other place. I used wire wrap (http://en.wikipedia.org/wiki/Wire_wrap) to connect all the components appropriately (component leads in general fit into the hole of a manual wire wrap tool), then once I was sure it was working I soldered the wire wrap connections. The motor is being held by the legs of the big capacitor, and the two back legs of the robot are just the bent legs of the smaller capacitor. The tire is a rubbery offset thing from the same CD-walkman that I got the motor from. The offsets help reduce vibration in old portable music players. This robot is pretty crappy, it was just a proof of concept. It has no sensors and ony one motor, but more power/motors/sensors can be added once you get a nice base working and you get the feel for everything.